Speed Reading Software Best Reader. Results of studies with speed reading software Best Reader. Wir senden zwei Briefe(Literatur) mit einem Registrierungsschlьssel(-taste) in 24 Stunden nach Ihrer Ordnungsbestдtigung. Einige Postfilter kцnnen unseren Brief(Buchstaben) als ein spam anerkennen(erkennen). Wenn Sie unseren Brief(Buchstaben) nicht erhalten(empfangen) haben, setzen Sie sich mit uns bitte in Verbindung. BEDANKEN SIE SICH BEI IHNEN! In February of 2006 we've asked a group of students to take ten speed reading studies with our speed reading software. In the end of each study we collected the results. 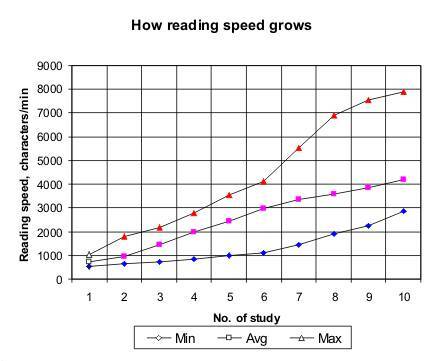 Here is the diagram of reading speed progress. Number of students - 46. Min is a worst result in the group (538 chars/min after 1st study and 2849 after 10th). Avg is an average speed in the group (721 chars/min after 1st study and 4212 after 10th). Max is a best one (1035 chars/min after 1st study and 7892 after 10th). The growth of the worst reading speed in the group is 430%. The growth of the average reading speed in the group is 484%. The growth of the best result in the group is 663%. You are able to get the same or better results in speed reading. Take the free speed reading test online and know your reading speed right now. If your reading speed is not high enough, you can increase it easy. It takes only two weeks to learn to read quickly and more efficient! increase your reading speed up to 10 times in 2 weeks. Wenn Sie helfen kцnnen, die Ьbersetzung zu verbessern, setzen Sie sich mit uns auf Englisch bitte in Verbindung. Translation of this page is not perfect. If you can help to improve the translation, contact us in English, please. Copyright © 2001-2019, by ReadersSoft. Alle Rechte vorbehalten.